Snaplight Lightbars Create Instant, Safe, Reliable Light During Power Outages, Evacuations, Severe Weather And Other Emergencies. They Turn On In A Snap, Mixing Safe Chemicals In A Plastic Casing To Create Instant Light. Each Lightbar Lasts 12 Hours..
6260010744229 "Chemlight Lightsticks Green, 6inch, 12hours,10/Box"
6260011785559 "Chemlight Lightsticks Red, 6inch, 12hours, 10/Box"
6260011785560 "Chemlight Lightsticks Blue, 6inch, 8hours, 10/Box"
6260011960136 "Chemlight Lightsticks Yellow, 6inch, 12hours, 10/Box"
6260012470368 "Chemlight Lightsticks White, 6inch, 30minute, 10/Box"
6260010744230 "Chemlight Lightsticks Yellow, 6inch, 30minute, 10/Box"
6260011959752 "Chemlight Lightsticks Infrared, 6inch, 3hours, 10/Box"
6260012308598 "Flexband - 7.5" Blue 6hr 12bx"
6260012650614 "Chemlight Lightsticks Blue, 15inch, 8hour"
6260011959753 "Chemlight Lightsticks Orange, 6inch, 12hours, 10/Box"
Snaplight Lightbars Create Instant, Safe, Reliable Light During Power Outages, Evacuations, Severe Weather And Other Emergencies. 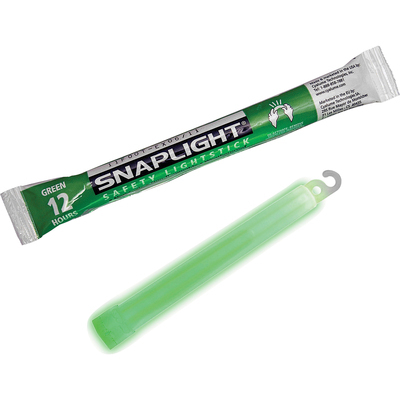 They Turn On In A Snap, Mixing Safe Chemicals In A Plastic Casing To Create Instant Light. Each Lightbar Lasts 12 Hours.